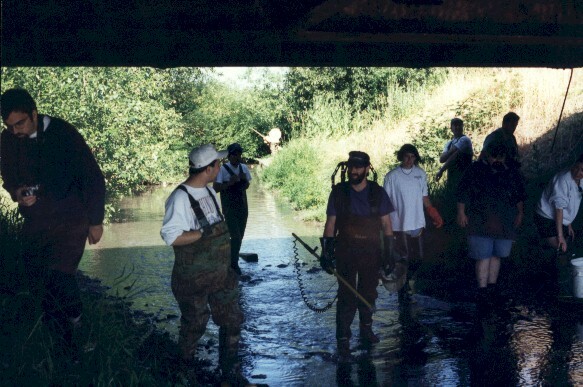 On June 29, 1996, Oregon and Washington NANFA members and friends met in Albany, Oregon, for a day of fish collecting. The day started at 8 AM, when we met and became aquainted. Present were NANFA members Jay DeLong, Norm Edelen, Dan Logan, Pat McDonald, Joe Middleton, Jonathan Short and Torrey Tyler; Greater Portland Aquarium Society members Rachel Lusby and Wayne Yamashita; Dave Simon, Kim Gould and Chip Hill from Oregon State University Department of Fisheries and Wildlife, and Hillary Forster from West Albany High School. We had three goals for the day. First, we sampled Cox Creek to verify a previously reported population of redbreast sunfish Lepomis auritus, which would be a record for the state. 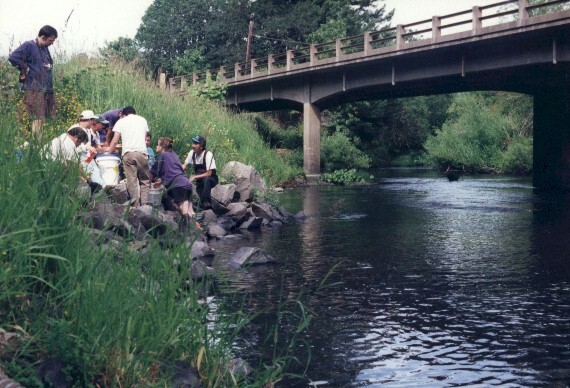 To sample native minnows and suckers, we then traveled across town to the confluence of the Calapooia and Willamette Rivers. Finally we traveled to the Marys River near the town of Wren to collect sculpins. Cox Creek is a tributary of the Willamette River located in Albany. It is slow-flowing and shallow (generally less than 2 feet deep), with mud, sand and gravel substrate. We fished with an elecrofisher at two sites in the creek and collected 8 fish species: western brook lamprey Lampetra richardsoni, common carp Cyprinus carpio, redside shiner Richardsonius balteatus, largemouth bass Micropterus salmoides, bluegill Lepomis macrochirus, green sunfish Lepomis cyanellus, yellow bullhead Ameiurus natalis and prickly sculpin Cottus asper. We also collected native noble crayfish Pacifasticus leniusculus and the exotic red swamp crayfish Procambarus clarkii. We didnt find any redbreast sunfish. 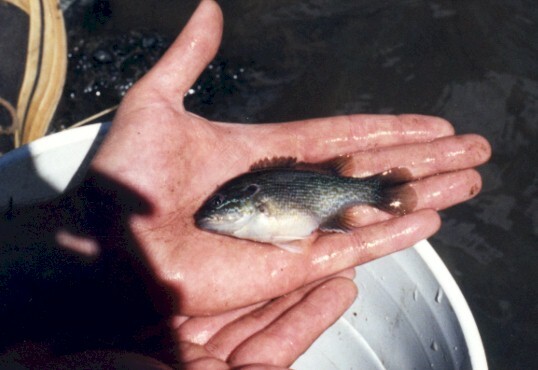 The green sunfish and bluegills were found in different habitats; we found green sunfish in shallower water among bank vegetation and boulders, and bluegills were generally in open water. The largemouth bass were found with the bluegills. Redside shiners were found only in the clearer, faster-moving water. The Calapooia River at its confluence with Willamette River was the next site we visited. We first sampled the river 100 upstream of the Willamette, where it was about 40-ft wide and too deep to sample all the way across. The substrate was silt, sand and gravel. We used a ten-ft seine in shallow water and threw a cast net into deeper sections, collecting the following species: white crappie Pomoxis annularis, northern squawfish Ptychocheilus oregonensis, largescale sucker Catostomus macrocheilus, largemouth bass, bluegill, mosquitofish Gambusia affinis, redside shiner, chislemouth Acrocheilus alutaceus, and threespine stickleback Gasterosteus aculeatus. 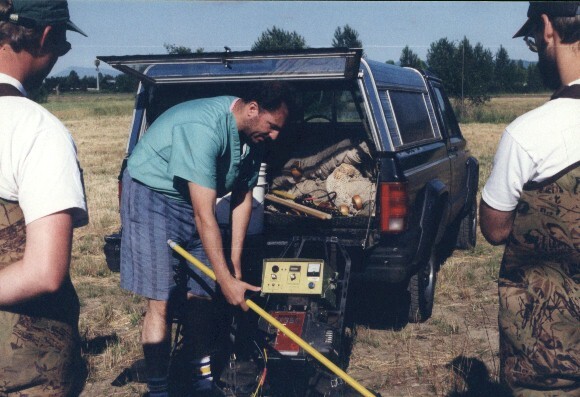 Sampling the Calapooia River are Dan Logan and some other poor seine-puller. The rest of the gang are taking it easy. 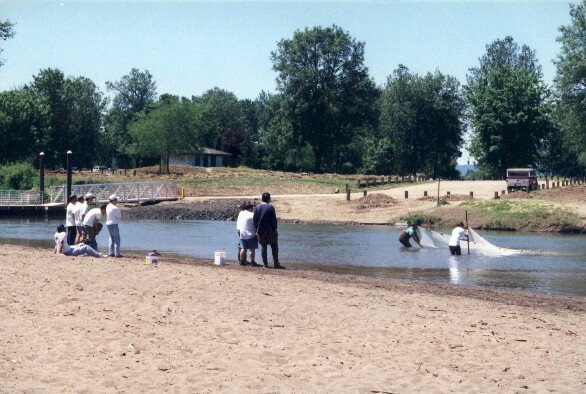 The Willamette River at the mouth of the Calapooia River was fast and had gravel and cobble substrate. 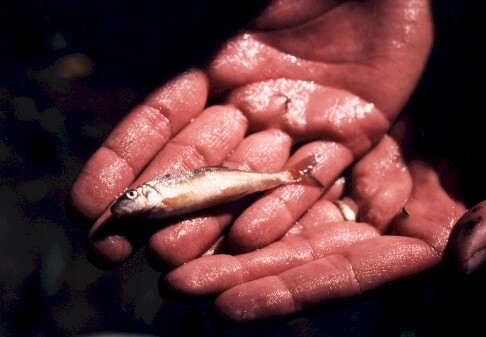 In the swift, knee-deep water we collected northern squawfish, largescale sucker, redside shiner, speckled dace Rhinichthys osculus and longnose dace Rhinichthys cataractae. Threespine stickleback and mosquitofish were abundant in the calm water along the shore. ...then they head for shore to examine their catch. Our final stop on this warm, sunny day was the Marys River. 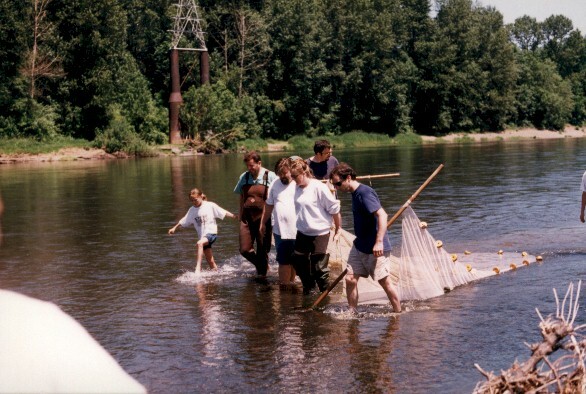 We used the electrofisher in this 25-ft wide river. The substrate was primarily cobble, boulders and bedrock. 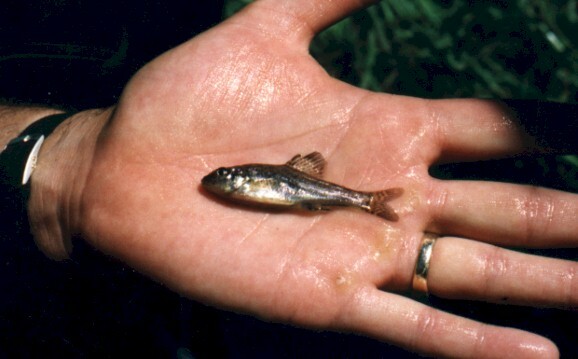 Fish were difficult to net in the swift waist-deep water, and many small ones floated away. 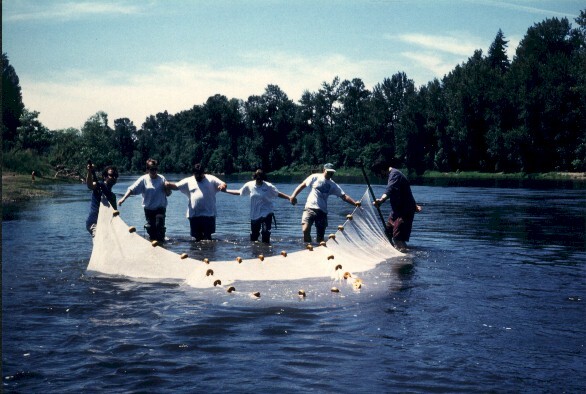 One adult Pacific lamprey Lampetra tridentata burst upstream when it felt the electricity. We collected: Pacific lamprey, sandroller Percopsis transmontana, torrent sculpin Cottus rhotheus, reticulate sculpin Cottus perplexis, Paiute sculpin Cottus beldingi, prickly sculpin, northern squawfish, largescale sucker, redside shiner, specked dace, and yellow bullhead. We found the sandrollers and yellow bullhead to be associated with boulders in the quiet waters near shore, while the sculpins were in the deeper, faster water. 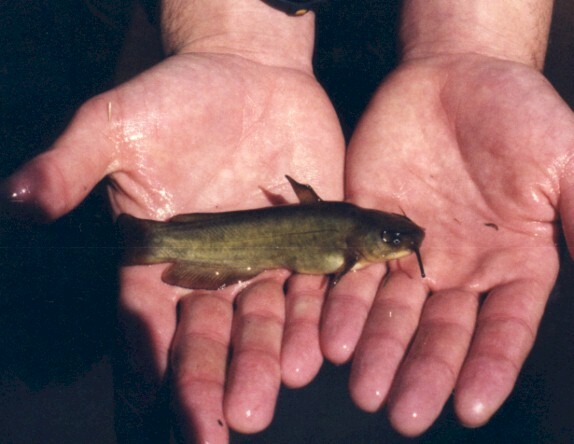 The minnows and suckers were found throughout the site. 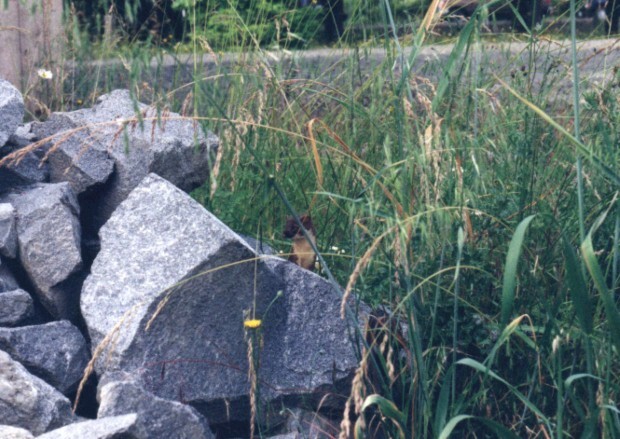 While we splashed in the water and sat on the bank we were entertained by an inquisitive long-tailed weasel on the bank only 10 feet away (Perhaps we were the entertainment). Chip Hill (in the green cap on the left) is sharing his sculpin knowledge with a captive audience on the banks of the Marys River. 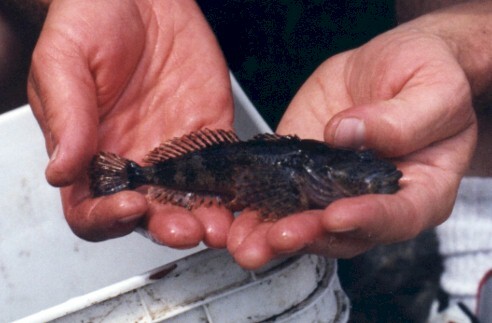 Chip recently co-authored a sculpin identification book. The day concluded at 7 PM. The weather, collecting and company had been terrific.